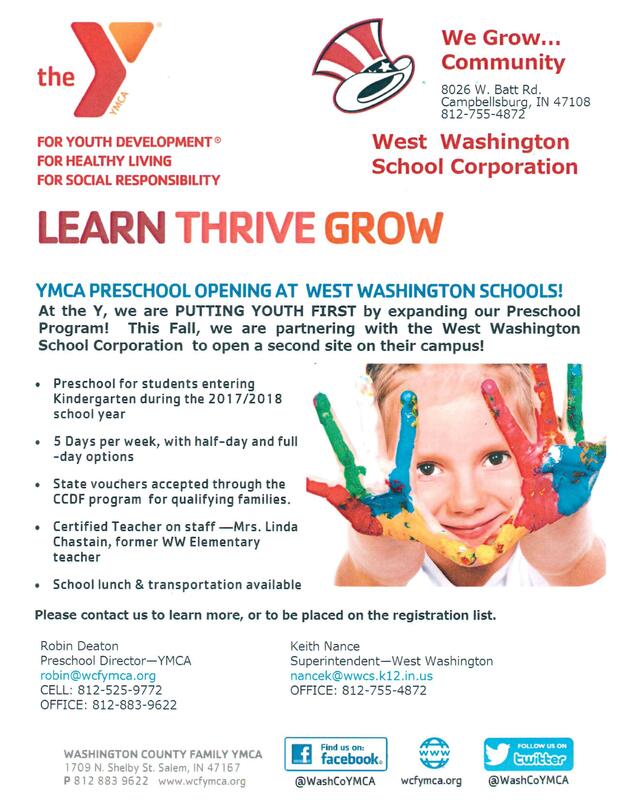 Enrollment for the WWSC/YMCA Preschool is officially open. Get enrolled early before it fills up. Everything that you need to know to enroll can be found in the Preschool Handbook linked below. The handbook is full of important information and can answer a lot of your questions. The registration may be turned in at the YMCA or at the WWSC Administrative Office. In addition to the registration papers there is also an application for financial assistance. Those interested in visiting the classroom and teachers may attend our Open House on August 1st from 5:30 pm - 7:00 pm at West Washington Elementary School. Enter Door 1 at the elementary and we will direct to the classroom. You are free to tour the rest of the school as well. This opportunity is available for families that have already enrolled and those that are considering enrolling a student. Families that are considering applying for state vouchers need to start the process immediately. Information regarding the state voucher program are in the link below.